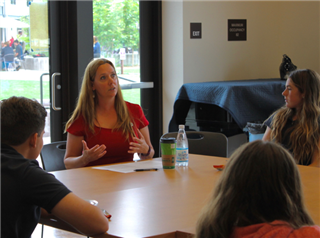 On May 4th, students enjoyed lunch with a side of career advice from Kelly Wilson, a Protective Security Advisor for the Department of Homeland Security. As part of Spark Sessions, a lunchtime conversation series featuring presenters working in STEAM fields, Ms. Wilson shared her career path, which has included work as an Emergency Management Agency Chief, an INTERPOL liaison, a Technical Intelligence Analyst in the United States Army, and more. She encouraged students to look to the future when considering job opportunities in emerging fields and gave advice on making the most out of any job position. If you have a suggestion for a future Spark Session speaker, please contact Eva Schmidt at eschmidt@pacificridge.org.